Village Rapatrier is a small community in Cité Soleil. The area is close to the ocean. Unimproved dirt roads provide a means of getting around. There is no sewer infrastructure or centralized sanitation; there are no gutters or no sidewalks; there is no security. There is a large amount of standing water in the streets, making it impossible to drive to certain areas. Locals must follow footpaths or jump on rocks and garbage to avoid the stagnant, contaminated water. When it rains or floods the rainwater traverses across the city and into people’s homes, causing additional contamination and increasing the spread of disease. Barriajou Miriline is a mother of three. She has a seven-year-old daughter, Neika Jean, who is in her second year of school. She has a five-year-old daughter, Francesca Victor, who is in Kindergarten, and she has a two-year-old daughter, Michael Victor (pictured right), who is still at home. Barriajou Miriline is a “machann” (street vendor). She sells sandals, undergarments, shoes, t-shirts and other miscellaneous items. She is currently faced with no more money to purchase new items to sell and is hoping to borrow from family or a friend. Barriajou Miri line is often sick, as are her children. They have common bouts of diarrhea, stomachaches, and headaches caused by the water they drink. They frequently miss school and work because of these illnesses. The local water source is a hand pumped well (pictured left), located a 25-30 minute walking distance from her home. This well is untreated. 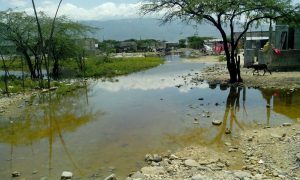 The water is contaminated with pathogens. 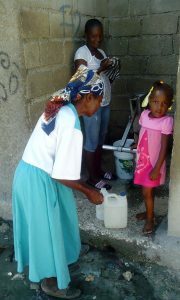 When they have the funds, Barriajou Miriline will disinfect the family’s water with Aquatabs (chlorine tablets). However, the store is not close and the tablets are often out of stock. When she has the money, she will purchase water at the store, but that is very rare. 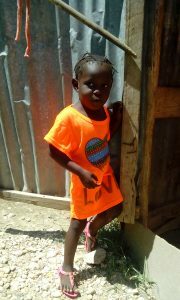 Share the gifts of safe water with Barriajou Miriline’s family by donating today.